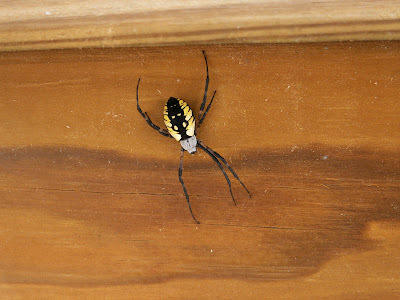 My bug book identifies this as black and yellow argiope. Very descriptive! In Texas, we call this a "sewing machine spider" b/c they make little zig-zag patterns in the their round-ish webs. Definately Argiope. WELL done Wombat! I'm proud of you!